» Forum » Game manufacturers » Homebrew pinball » Crazy Homebrew Pinball - AZIZ ! » Crazy Homebrew Pinball - AZIZ ! Crazy Homebrew Pinball - AZIZ ! Check out this wild pinball some friends have been working on. It never ceases to amaze me the imagination of some people. not only arty but looks like a blast to play with some cool innovation. 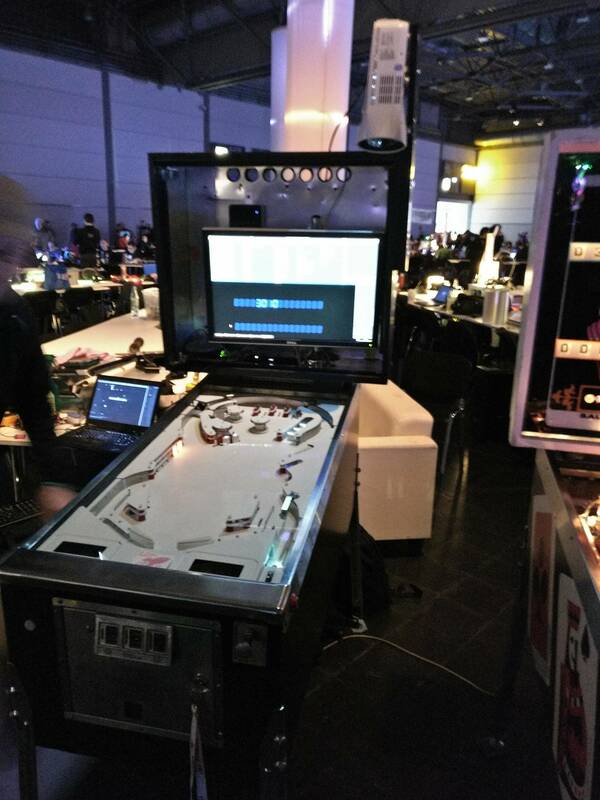 I played the machine at 35C3 in Leipzig, Germany after Christmas last year. Awesome machine. Fun to play! I thinks its' really cool! Love the secret lock behind the flipper! neat idea! will it work with glass on? The picture above is with glass on. It did not even had invisiglass and worked fine. The glass is also clearly on in the video. SO glad someone took the initiative to actually DO IT. Also very happy to see the light projects through regular glass. I never agreed with the way multimorphic decided to put a giant LCD screen in the middle of the playfield (but commend them on their PROC platform). This allows complete mechanical freedom without compromise. I really think this could change pinball drastically. Everyone complains "oh, there's only so much space on the playfield". well if you could change the art on the playfield, plastics, and targets this could allow a more video game experience where the entire playfield could change modes. I can only imagine what this could do for movie themes. Great job guys, can't wait to see what you do with it! One other thing (that I'm sure the OP of this thread has already realized but maybe others don't). With a system like this, theoretically you eliminate all insert and GI lighting. Not only does that dramatically reduce cost both in parts and labor (depending on what the projector costs) but it eliminates a ton of wire and spacer potentially opens up more room for under playfield mechs. Seriously, all that NEEDS to be underneath as far as wiring is for coils and switches. One other thing (that I'm sure the OP of this thread has already realized but maybe others don't). With a system like this, theoretically you eliminate all insert and GI lighting. Not only does that dramatically reduce cost both in parts and labor (depending on what the projector costs) but it eliminates a ton of wire and spacer potentially opens up more room for under playfield mechs. Seriously, all that NEEDS to be underneath as far as wiring is for coils. Lets do it bro. Ive got access to projectors and mapping software at work. Ill have room to set something up at our office within 6 months once we expand. Just need a flipping white wood. I assume by watching the video that all the triggers are made by the switches, and are not visually qued by a camera or something. That makes it WAY easier in my opinion. I don't think you're going to be able to replace a whole art package this way - even if it's capable of that level of detail I expect it'll strobe like crazy - but replacing lamps? Yeah, I can see that. Fake inserts or tactically-empty areas of art that you then beam on top of. The trick would be not to go overboard with it, so every time you use it for something over than an insert, it never stops feeling special. Have they tried projecting on top of printed art, and seeing how clearly it turns out? Have they tried projecting on top of printed art, and seeing how clearly it turns out? Really impressive! Reminds me of the game Geometry Wars. You could do some really insane effects with this tech. For those of us who are new to this, what is the deal with projection mapping? How does it work? If you have a spare LCD projector laying around you can try it at home. I picked up a used one on ebay a few years back for $30. Ah I didn't notice the projector mounted above the playfield. I see the point about the art shining through in certain lighting conditions, but if you were shining onto white parts (black parts?) it should work pretty well in any lighting conditions, right? I'm just thinking that you wouldn't do anything where all of the art is projected like they did (or analogous to P3), but indicators and GI highlighting would still let you not only save tons of wiring under the pf but also, as they did, add easy text and graphics to tell the player what to do without taking their focus off the pf. Are they lasers or can the same effect be done with just a bright projector? I would really like to get in touch with the people that made this. Does anybody knoe how to contact the aziz light crew?